A highly pigmented tennis court color coating system designed for tennis courts and other sport and recreational pavement surfaces. ColorPlus Pro features superior hiding, vibrance, and ultra-violet fade resistance. A highly concentrated water based pigment dispersion. A highly concentrated water based pigment dispersion designed for mixing with SportMaster Neutral Concentrate (with or without sand). ColorPlus produces a consistent mix and color, even on multi-court batteries. The ColorPlus tennis court color coating system has been in use since 1997. Similar to that of a paint store, ColorPlus saves time and money by minimizing the amount of inventory on hand. Why buy a 55-gallon drum of blue tennis court color coating, when you only need a half drum. With ColorPlus, just equally split the full drum of Neutral Concentrate and add 2 gallons of ColorPlus pigment to each half. You will produce a half drum of blue color concentrate and you can make the other half a different color. Did you, or your customer, change your mind on the court color? 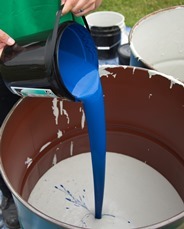 It’s easy and inexpensive to ship 1-gallon pails of ColorPlus Pigment vs large drums. Sand (80-90 mesh AFS) – 400 lbs. Mix thoroughly to ensure complete dispersion of pigment. Water – 15 – 18 gallons Sand (80-90 mesh AFS) 200 lbs. Apply mixed coating with a soft rubber squeegee. A minimum of two coats are recommended.